The East and West Storage Yards are essentially identical and have been through two previous iterations before they achieved their current form. 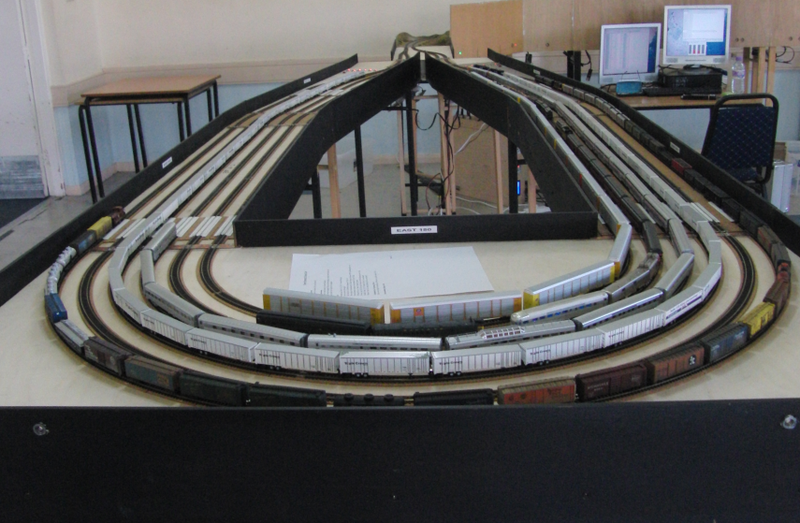 Details of the electrical operation of the yards is on the layout DCC page. In their current form, after a 1:2 module and a 2:4 module, a pair of wedge-shaped boards flare the yard fans wider than they used to and then another pair bring the 6:6 staging modules parallel to each other. We now have 6:6 staging modules 2' and 4' in length which can be used separately or together to make yards of varying sizes. Short, with 2' 6:6 boards. Standard, with 4' 6:6 boards. Long, with 2' and 4' 6:6 boards. This makes the yards slightly fatter (and also provides a little more storage as the there is a few more inches of track on the wedges). 1 (outermost) 12' 3" 16' 3" 20' 3" 24' 3"
2 11' 9" 15' 9" 19' 9" 23' 9"
3 12' 8" 16' 8" 20' 8" 24' 8"
4 12' 2" 16' 2" 20' 2" 24' 2"
5 10' 6" 14' 6" 18' 6" 22' 6"
6 (innermost) 9' 11" 13' 11" 17' 11" 21' 11"
Total 69' 3" 93' 3" 117' 3" 141' 3"
Of course, this is one yard! 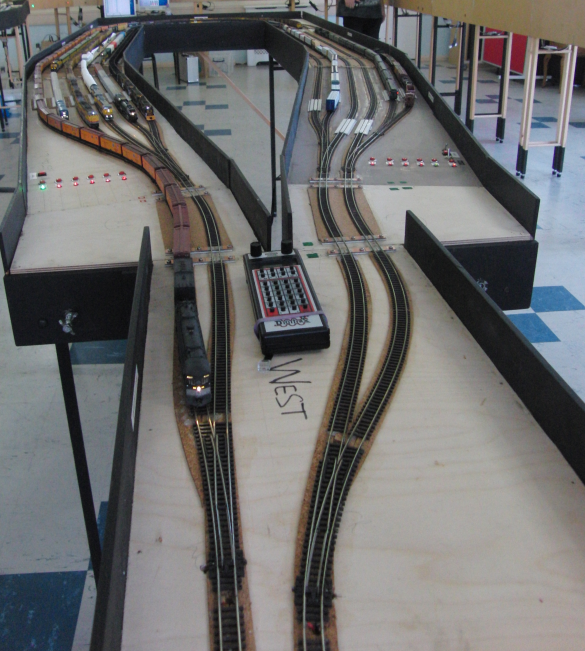 33' feet in N-scale equals one scale mile so all the tracks in the two yards total between 4.2 and 8.6 scale miles of off-layout storage for trains. We might make more six track staging modules to increase the flexibility and capacity of the yards still further!